Hydradermabrasion at Precision Laser uses revolutionary water jet peel technology as well as patient-tailored corrective and nutritional topical serums. This innovative, natural skin rejuvenating technology employs a sterile saline solution which is applied to the skin at supersonic speeds. This process, in turn, not only cleanses and exfoliates the skin, but simultaneously infuses the skin with oxygen as well as nutritional serums such as Vitamin C, collagen, and antioxidants. Delivering therapeutic, patient-tailored ingredients has never been more effective than with Hyrdradermabrasion because water jet peel technology literally opens up channels in the skin for easy penetration and absorption. Typically taking 20-30 minutes, hydradermabrasion is the painless alternative to harsh chemical peels with noticeably visible results following each session. Hydradermbrasion is also often beneficial as an add-on to an existing treatment. For instance, the efficacy of IPL Acne treatments can significantly be improved when preceded by hydradermabrasion. 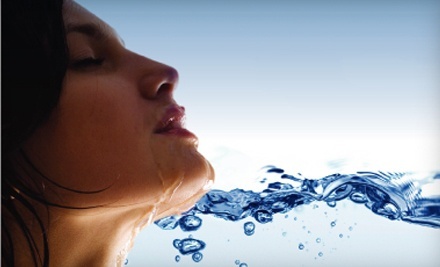 This is because hydradermabrasion uses oxygen to kill bacteria while, deeply cleansing and opening the pores. Meanwhile, the IPL Acne treatment closes the pores preventing further congestion. So Who & What Does Hydradermabrasion Benefit? Hydradermabrasion is viewed as a corrective procedure formulated to address many different skin conditions. For oily or acne-prone skin, the treatment exfoliates the dead layers of superficial skin, purges trapped oils, and helps to extract both blackheads and whiteheads. The infusion of oxygen to the skin, meanwhile, helps to kill acne causing bacteria. For rosacea, the treatment gently exfoliates without the traditional harsh side effect of chemical peels while facilitating more easy absorption of antioxidents. The exfoliating capacity of this treatment is also effective for hyperpigmentation and melasma. The duality of exfoliation with hydration is also the perfect answer for dry, flaky skin. Finally, mature, aged, or menopausal skin will benefit from hydration as well as a reduction in fine lines and wrinkles.